Quoll-ity habitat is the key for the survival of our quolls. These rabbit-sized mammals may look cute, but with cat-like teeth you wouldn’t trust feeding them a carrot by hand. Because of their size they are sometimes known as our ‘native cat’. In fact they are probably cuter than cats (controversial we know!). All quolls are not equoll; there are 6 species of quoll; 2 in Papua New Guinea and 4 in Australia. We’re looking after 2 species with Edge Pledge; this Eastern Quoll and the Western Quoll. The eastern quoll once ranged over much of south-eastern Australia, but is now all but extinct on the mainland. Encouragingly they are pretty common still in Tasmania, where they live in open forest and scrubland. A bit like black cats, there is the odd unconfirmed sighting around New England NSW, which gives some hope that some may still be surviving on the mainland. Eastern quolls eat mainly insects, birds, frogs, lizards, snakes, small mammals and fruit. Quolls scavenge dead animals and hang out around campsites and rubbish bins doing some dumpster diving. The bigger cousin (spotted tailed quoll) gets stuck into larger meals; birds, reptiles, bandicoots, possums, echidnas and rabbits. They can do this because they are 4 times the size of the eastern and western quolls. Quolls go to the toilet at the same spot – open spaces such as rock ledges. We guess for hygiene reasons – they don’t want to spoil their beautiful coats – but most likely for marking their territory. It only takes a year for quolls to be able to start breeding. This is a necessity given that they don’t live long – an average of two years. Two years! Once they are big enough, mum carries them on her back and they are fed in a nest for 6 weeks. The quoll is on the edge is because it is fussy, it doesn’t live long, the places where it lives have been destroyed and foxes are out-competing them. The quoll is described as fussy because it requires specific habitat and food. It turns it’s pointed snout up at a lot of food and when it only likes certain areas, having cats and foxes around makes these areas even harder to stay in. We want to get a handful of populations thriving across the mainland of Australia. • $100,000 +: Establish additional ‘wild’ populations within a protected fenced reserves. 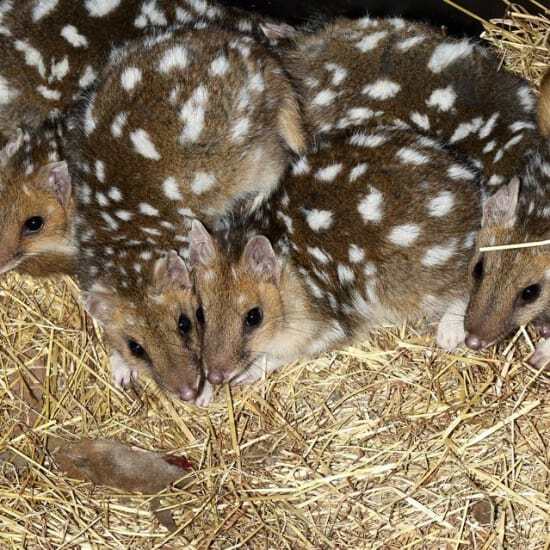 The only wild, self-sustaining Eastern Quoll population on mainland Australia currently resides at Mt Rothwell Biodiversity and Interpretation Centre.